About Stalos - Chania Crete Print E-mail Kato Stalos is the most worth mentioning suburb of the city of Chania. 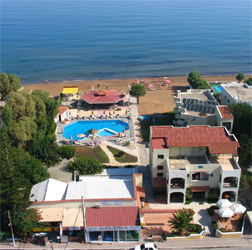 Its location nearly in the middle of the distance between the city of Chania and Platanias (at the north part of the island), makes access easier either to those who wish to go to Chania for sight seeing, for shopping and to have fun or to those who enjoy the wild night life of Platanias. The public transportation is very often (the buses pass by every quarter) and there are a lot of cabs awaiting. Stalos is characterized as a highly touristic destination. The beaches along the coast have the blue flag, are sandly and the sea is really swallow, ideal for families with young children. However there are points where someone can practice all kinds of sea sports. But what attracts tourists the most is the fact that Stalos combines the easy access, the natural beauty, the peace and at the same time the wild night life and fun, without lacikng anything particular comparing to other places in Chania. Click image to openMetochi Neighborhood in Pano Stalos Village Metochi Neighborhood in Pano Stalos Village Along the old road you will find every kind of stores and shops to satisfy your every need. Tavernas with local food, restaurants, cafeterias, mini golf, mini markets and touristic shops so as lots of beach bars wait for you. Small boats from the old harbour in Chania are making trips around the small island of Agii Theodori which is located opposite the beach of Stalos. However, if you wish to be closer to nature, a walk to Pano Stalos is what you seek. You can see the old village arising among olive trees, narrow roads full of flowers outside the houses yards, traditional restaurants and cafeterias.